Ed Slott and Company's eSeminar is now available ON DEMAND! Listen in your office, at your home or on the go! You can now listen to each session at your convenience, allowing you to gain timely and critical IRA information when it fits into your busy schedule. The NEW tax laws have created consumer confusion, and in turn, MASSIVE opportunities to stake your claim as an expert in your field. Guide your clients to safety and impress high-net-worth prospects with the latest IRA distribution planning strategies. Our online training includes 7 web-based sessions packaged as a group or available separately. Each 90-minute session comes with a 40-plus-page handout. After listening to the recording, take a quiz to test your knowledge. In order to be eligible to join Ed Slott's Elite IRA Advisor Group, you must successfully pass each quiz. With your registration, you have access to the materials for a 6 month period. 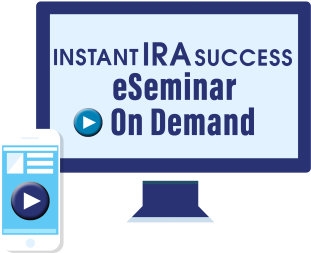 Ed Slott and Company’s Instant IRA Success eSeminar includes 7 sessions packaged as a group or available separately. You can take individual sessions for $289/session or take all 7 sessions for $1795. Below is a list of the 7 sessions offered. Ed Slott and Company’s Instant IRA Success eSeminar is a web-based training series that educates financial professionals on IRA-distribution planning. Below is what advisors are saying about the education and business-building practices they received through the eSeminar. How can I register for the eSeminar Series? What will be covered during these sessions? Does completing the eSeminar Series make me eligible to join Ed Slott’s Elite IRA Advisor GroupSM? How long do I have access to the sessions? Once I have purchased the sessions, how do I access them? Am I able to listen to the sessions at any time? 1. How can I register for the eSeminar Series? You can register by clicking the REGISTER HERE green button above this box. You can also print out the enrollment form and fax it to 516-536-8852 or give us a call at 800-663-1340 and a staff member will be happy to assist you. Your registration fee includes admittance within a 6-month period to each paid session (you can take sessions separately or packaged as a seven-session series) as well as a 40-plus-page downloadable manual that accompanies each session. 3. What will be covered during these sessions? IRA-distribution and tax laws are always changing. We continually update our program agenda. Click here to view the current agenda or use the green button on the right hand side of this page. No. Unfortunately we cannot offer CE credits for our online sessions, but Ed Slott and Company's 2-Day IRA Workshop does offer insurance continuing education credits (varies by state), PACE, CFP, NASBA, IRS and Continuing Legal Education credits. If you need CE this year, consider attending our live workshop. Yes. Please contact Kira Fasanella (kira@irahelp.com) about special group pricing. 6. Does completing the eSeminar Series make me eligible to join Ed Slott’s Elite IRA Advisor GroupSM? Yes. You are eligible to join Ed Slott’s Elite IRA Advisor GroupSM as soon as you complete all seven sessions and pass each quiz given at the end of each corresponding session. You are eligible for two years from the date you complete your last session. Please contact Member Relations Manager, Matt Smith (matt@irahelp.com) for more information on benefits and pricing. 7. How long do I have access to the sessions? You will have 6 months to complete the sessions starting from the date of purchase. After 6 months, you will no longer be able to access the materials. You will be able to see your expiration date on the eSeminar access page where the recordings and materials are housed. 8. Once I have purchased the sessions, how do I access them? Log in to www.irahelp.com. Once you are logged in, you will see a link to “eSeminar” in the log-in box. Click that link and you will be directed to a page with the recordings and session materials. 9. Am I able to listen to the sessions at any time? Yes! One of the benefits of the on demand eSeminar is that you can listen to the sessions at your convenience! You can take the sessions in any order that you’d like and you are able to listen to them at any time within the 6 month purchase period.